I'm a Melbourne boy, hailing from St Kilda with one ex, one current wife and four kids. Love the outdoors and making new discoveries. I cook a lot at home (cheers from wife) and do some preserving, mostly jams, pickles and fruit liqueurs. This is the diary of a cooking journey. 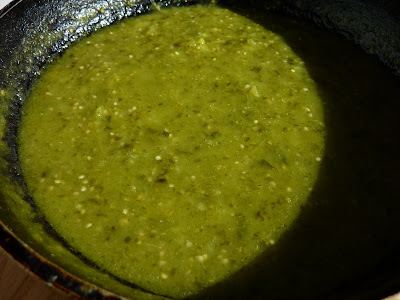 One of the everyday table sauces in Mexico is salsa verde (green sauce), highly adaptable and a staple throughout the region, right up into the Southwest of America where it is known as chile verde, confusingly which, according to cookbook author Huntley Dent, can mean one of several different things: Apart from the sauce for instance, chile verde means green chillies picked before they turn red and he points out that even a sauce made from ripe red tomatoes is still considered chile verde so long as it contains green chillies. However, in Mexico, salsa verde almost invariably means a green sauce made from tomatillos, a fruit, that when stripped of its papery husk, looks uncannily like a green tomato and is indeed sometimes called exactly that. It has a pleasant sourness, which in partnership with hot green chillies is the cornerstone of salsa verde, whether or not it's cooked or raw. Here in Melbourne, fresh tomatillos have been incredibly difficult to find and anyone wanting to make this sauce virtually chained to using tins. But with the growth in farmer's markets, it has become possible for those willing to grow niche vegetables to sell directly to enthusiastic home cooks, who don't mind paying a premium to secure otherwise unavailable and unimagined produce. At $30kg, fresh tomatillos work out to be roughly double what you would pay for tinned. If you were making an uncooked sauce, you'd put your money down. However for a cooked sauce, the difference isn't quite so large, but if you prefer the vibrancy fresh produce brings and the slight gumminess that is largely absent from the tinned version, well, pay up. The main advantage of a cooked over uncooked sauce, is that a fresh sauce really must be consumed the day it's made, whereas the cooked version will happily last a few days in the fridge and responds well to freezing - so make a big batch while tomatillos last. 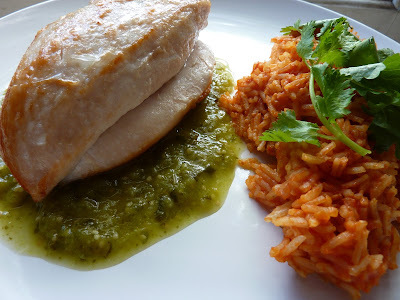 Salsa verde is very accommodating, you can serve it with chicken as here, or pork. Enchiladas by their very nature love the contrast it brings, or a large bowl served with corn chips and too much tequila will make your friends very happy and you a legend! In a pot of boiling water place the tomatillos and chillies serranos and simmer for about 5 minutes or until just soft, Strain and reserve 50ml of the cooking liquid. Pour the cooking liquid into a blender with the coriander and garlic, blend until smooth. Add the tomatillos and pulse until the tomatillos are chopped, still with some texture. Heat the oil gently in a frying pan and add the mixture, salt to taste, give a stir or two, then simmer until the sauce reduces to a slightly thickened consistency. Check the seasoning. Serve hot or cold. Great looking recipe. I have never heard of tomatillos before. I have a desire to learn legitimate Mexican food, it looks so vibrant and fresh. Beautiful! I am not sure if I could get my hands on those. And yes, they must be really expensive! Great pics Neil. What camera are you using? I love salsa verde. I've grown tomatillos for the last two years and they are amazing prolific. In fact, at the end of the season I have to throw away hundreds of them (from two plants; you have to have two of they won't produce.) And they do take up a bit of space in the garden, but otherwise very easy to grow! 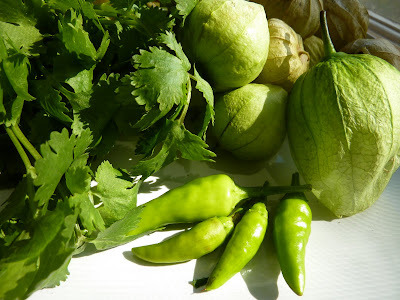 I don't grow vegetables in my garden, but I ask a neighbor to grow tomatillos for me every summer, and I trade for herbs. This summer I'm going to try to grow Mexican oregano, which is a nice addition to salsa verde, too. Hi mark, you'll be a convert for sure, dive right in! Hi anh, I'm sure you would find them at your local farmer's market. The guy I bought these from thought the season would go until about mid-April, worth seeking out. Hi stephen, thank you! The pictures probaly owe much to the sunlight streaming through the window at the time. My camera is a point & shoot Panasonic Lumix DMC-TZ7. Hi kalyn, thanks for the info, will locate some seeds next year and give it a go. Throw away hundreds, I'm crying. Hi lydia, we grow regular oregano, but not Mexican, would love to get my hands on some and would definitely add some to the salsa verde next time, wouldn't mind a squeeze of lime either. Neil, I have difficulty finding a farmers' market. I am quite "new" to this side of town. Hi anh, click on, Cook (almost) Anything at least once, in my left sidebar links and then click on the farmer's markets tab. There's the main list for the upcoming weekend and a market schedule at the bottom right. Hope that helps. Biggest crop yet down here at Birregurra, will pickle sauce and swap... but have you tried guacamole with them? Hi george, that's a really impressive crop you've got, totally jealous. I have had that combo, green on green, wouldn't the Irish love that on St Pats! Are you referring to a particular guac recipe? Hi anh, know the problem, my daughter has netball every Saturday right in the middle of market time. Looks gorgeous! If I want tomatillos I will have to go to the US, but the seeds, smuggle them back and plant them myself. Oh, and I have to go now, because when I am normally there in the fall there are no seeds available. I'll just enjoy yours - Love, love the color. Hi katiez, I had a friend who, unbidden, sent me some chile seeds in the post, just thinking out aloud here. Foie gras, you know how to make my mouth water. Hi joanie, I'm sure you'd love it, there's a nice little kick to it. Hi Neil we've recently returned from San Diego and just fell in love with all things Mexican (food). Had a breakfast which included salsa verde. I've been on a Tomatillo mission since returning and can only find the tinned version. I'm heartened to learn some farmers markets are supplying and also Kalyn's post. 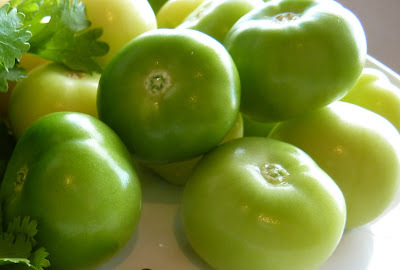 Let's hope for a tomatillo invasion down under! Hi richard, that's one invasion I'd support. We're saving some seeds this year from tomatillos we got from a farmer's market, so hopefully there will be a good crop for us next year. Have purchased the tomatillos at the Deans Marsh Festival yesterday. Some yellow some green, which are ripe? Will save some seed but again of the yellow or the green? At My Table by Neil Murray, all rights reserved. You may re-post a recipe, please give credit and post a link to this site.